112 presets and 23 brushes. This workflow is huge. It has plenty of documentation on how to use everything included, and I had no problem reading the directions. The majority of the presets are vintage/retro/film inspired. This is not my normal editing style. My style is more “real life, real colors”. 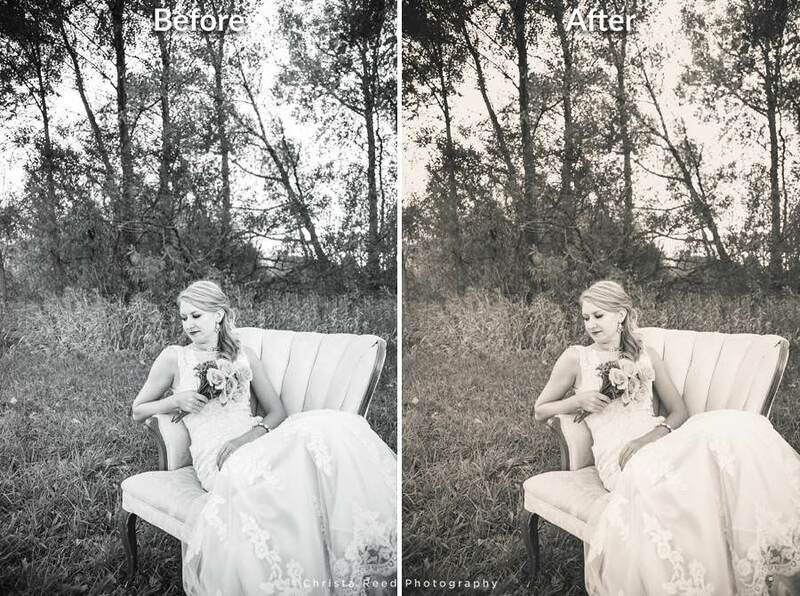 These presets take things a step further with additional toning and color shifts. Image Choice: I picked pictures of photographer Amanda in her wedding dress from the last photographers meet up we had to test this workflow. I felt the shoot matched the presets style best. Her pictures have the potential to be retro and still look polished. Very Flexible, as long as you know your way around Lightroom. I feel like you will be most successful with this workflow if you know Lightroom well. If you like to spend time playing, adjusting and painting you’ll get that need fulfilled. 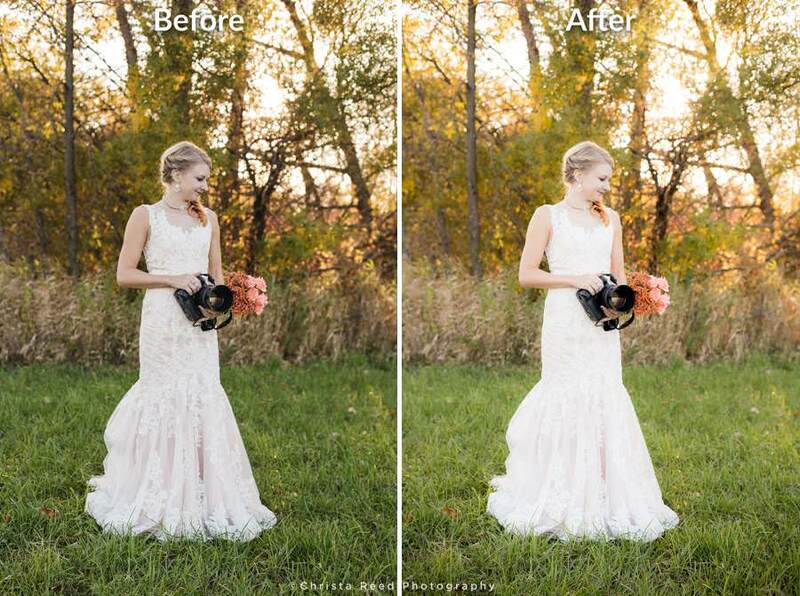 Below is an edit using the preset Wedding Vintage Poor Orange plus some painting with the Fix Underexposed brush. It’s much more retro than my original edit. It has a warm tone that contributes to the loss of green in the grass and blue in the sky. One Click & Done? No. You will need to explore, experiment with and adjust before using on client work. All of the pictures I edited were correctly exposed in camera. Even so, I found this workflow was not a one click editing solution for me. I spent a few hours over the course of a week playing around with the preset options before I felt comfortable editing. The example below has my normal edit, which adjusts white balance, rescues details in the highlights/shadows, and enhances color. 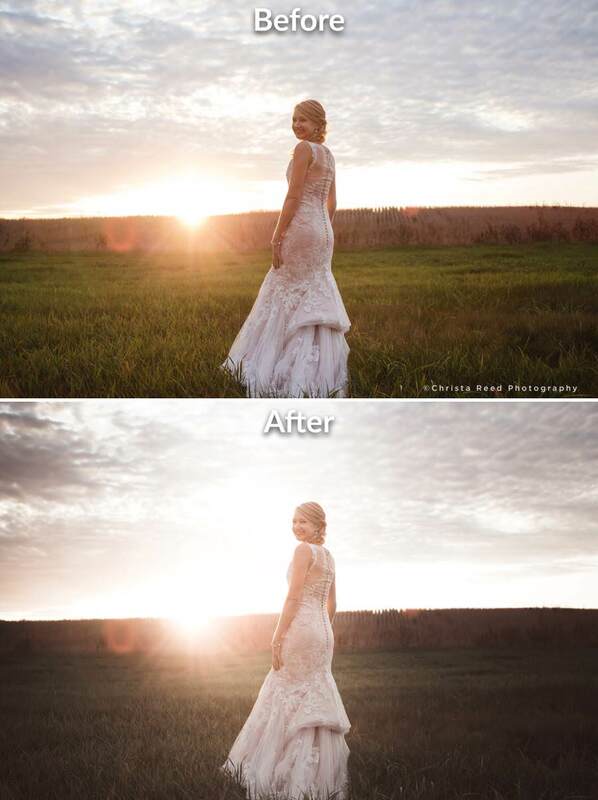 The After image is the Sleeklens preset All In One Romantic. It was the closest I could get to a one click edit. This preset workflow comes with a recipe PDF. It includes the adjustment directions for examples Sleeklens uses to show off the workflow. The example pictures are often why you buy the presets. I wish more preset creators would include a recipe PDF. Below is an edit following one of the black and white recipes. It’s more warm/vintage than my usual black and white edit in the Before pic. I’m not really into tinted black and whites. BRUSHES. The brushes included are very helpful for correcting skin tone, shadows, highlights and sharpness. There are 23 brushes, something for every cosmetic or exposure correction I need. I’ll definitely use these brushes. The Add Golden Sun brush was my favorite. It let me enhance existing streaks of sunlight in the After picture below, and it looks natural. I often have to make my own brushes because I can’t find good pre-made ones. A really big workflow. I was overwhelmed by all the options when I went into Lightroom. I make my own presets more than I buy them. This is seriously the biggest workflow I’ve experienced. You can’t load these presets into Lightroom and go to town on client work without first getting to know them. I went from being frustrated with the workflow to wanting to experiment more with it. 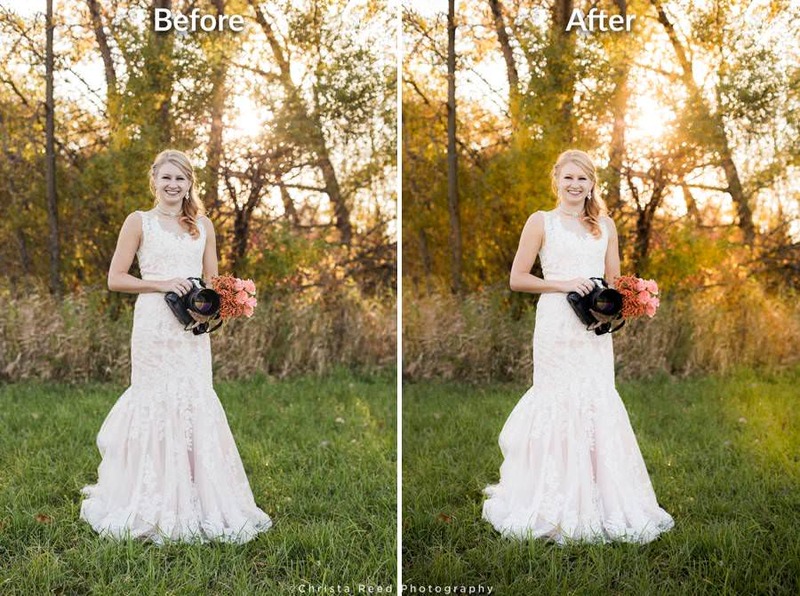 Below is an edit I did with the preset All In One Wedding Happy. I have seen other photographers edit like this, and I know there are people who like this style. The colors get a little faded, the contrast gets lowered and you can call it a Matte or Retro edit. Should you buy this workflow? ONLY if it fits your style. When I looked at the examples on the website I knew immediately they weren’t my style. Are the examples achievable? Yes, because you get the recipe PDF with the bundle. I enjoyed the experience of learning a different style of editing. It’s a decent workflow for the style. If using vignettes, matte looks, color shifts, and split toning to add a retro vibe to your photography brings you joy, these presets will be a good investment. Some of the presets are really far outside the natural look I edit in, and I will probably never use this whole workflow. This is a workflow for photographers who love this style, like to experiment in Lightroom, and need to build up their preset library. If you like these presets you can purchase them here. When I feature a vendor on my blog, it will always be based on my honest experience with the vendor. Though I am sometimes compensated for features I will only feature vendors and products I believe are truly helpful for my clients, and I have used myself. If you have presets you want to see a review on, leave a comment below or contact me .